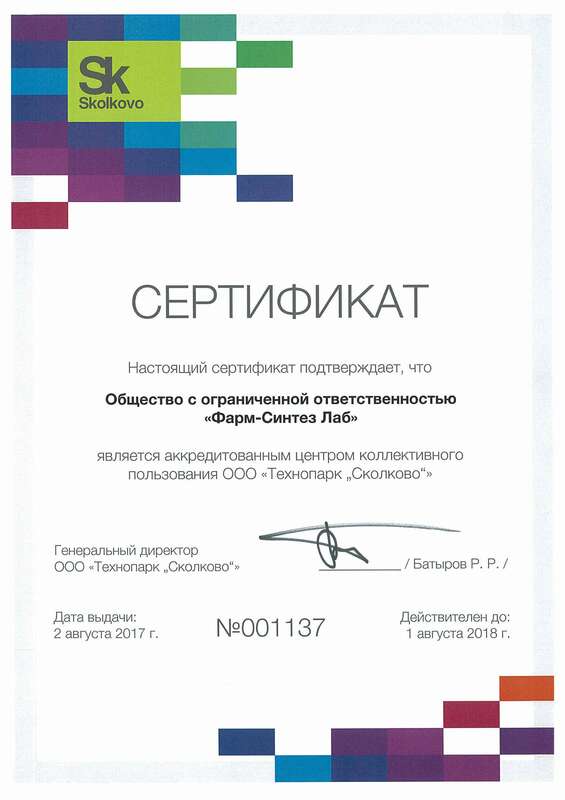 Resident of Technopark Skolkovo – company «Pharm-Sinte.Lab» has received the certificate, confirming the status of the official center of collective use (CCU) Skolkovo. On 2nd of August, 2017, the CEO of Technopark Skolkovo – Batyrov Renat, has officially appropriated to Pharm-Sintez. Lab status of the center of collective use. "Obtaining the official status of CCU of Skolkovo does not only confirms the high level of competence of team and partners of the center, but also is a quality assurance of the services provided by the center. The certificate also allows the company to work on microgrants for participants of Skolkovo with better terms and conditions"
For participants of Skolkovo an appearance of a partner like this opens new opportunities, because each center is unique and allows to realize new ideas and experiments. Now company "Pharm-Sintez.Lab" is a part of Skolkovo infrastructure, which has a positive impact both on the company, and on Technopark, as well as its internal investment climate. "Pharm-Sintez.Lab" provides chemical and analytical services. Our long-term experience is a quality assurance of our work and services provided by them. The company is engaged in development and peptide synthesis, production of pharmaceutical substances by own technologies, and also development of radiopharmaceuticals.